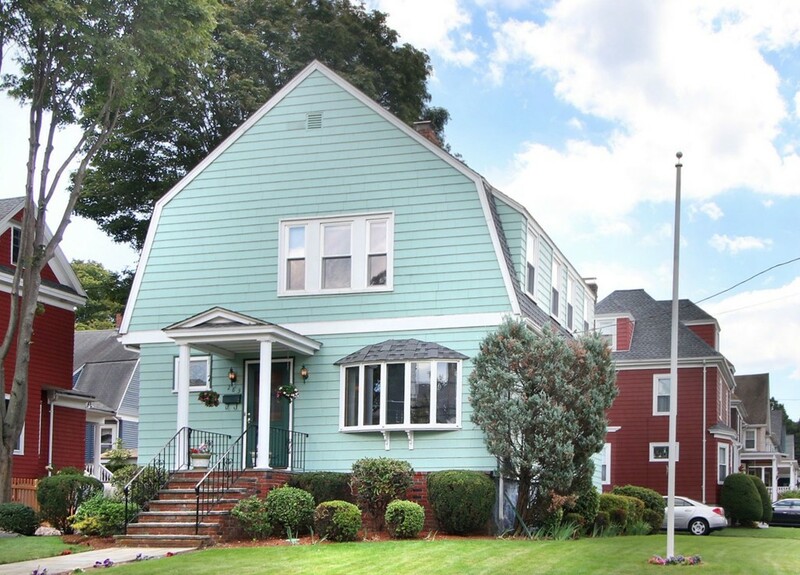 Cherished Gambrel Colonial lovingly maintained awaits your personal updates. The owners have been stewards of this charming home for over 50 years and have enhanced thoughtfully: wifi thermostats, C/A, C/V, sprinkler sys, Andersen wndws on the 1st flr, exterior gas grill line, custom stained glass & more! The EIK features custom blt oak cabinetry includes covers for the sub-zero and Bosch DW, full extension drawers, and even a mixer set-up that will be the envy of every baker. Granite counters, Thermidor gas stove, bar area with leaded glass detail, all coupled with storage conveniences. The combination living room/dining room, bathed by beautiful natural light from the bay and bow windows, is centered by the gas fireplace, and opens to the family room. Three BRs plus full bath, and even sunset views on the 2nd. LL hosts half bath & expansion possibilities. Private yard with slate patio bordered by annuals & perennials. Easy jaunt to train, bus, downtown, the Common, Fells & more!